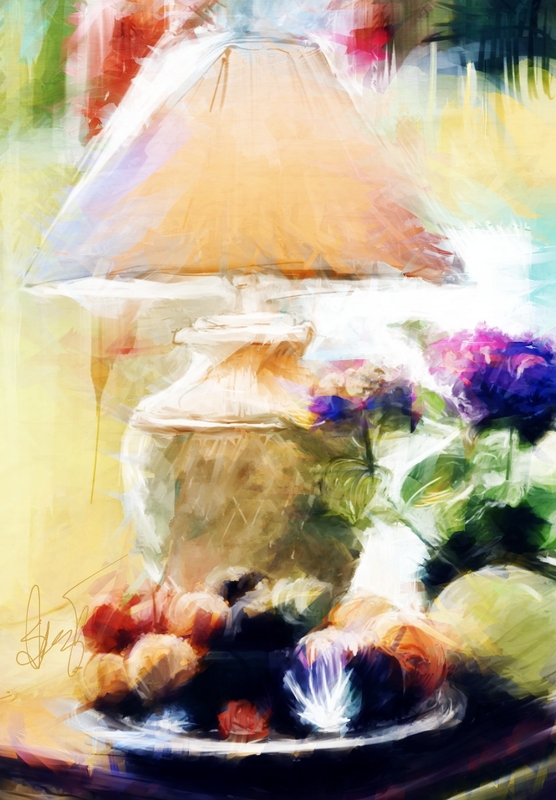 This entry was posted in Skip Allen & Painter 12 and tagged 4 - Point Tiling, Alpha Channels, Clone Source Panel, Cloning, Corel Painter 12, Corel Painter 12 Class, Corel Painter 12 Tutorial Video, Digital Art Academy, Offset Sampling, Skip Allen, Skip Allen and Painter 12. Bookmark the permalink. I love the lamp. This version is the tops! The lighting is terrific! I appreciate the compliment. I’m trying to do something tonight in watercolor but it is a struggle…LOL…isn’t it always. Thanks 2DPixel.com for the ping back. You have a great site and are a terrific resource. I was just working on it. Skip, I’m new to Painter, well sort of, I bought Painter3 many years ago and didn’t use it much. I missed this class, but I can see I have a lot to learn. I hope you have it again. I’m really interested in the watercolor one you have coming up as I love the medium. In the meantime I trying to teach myself from a book. I prefer videos to reading :O) Yours are great because you are so fun to watch. I love seeing you stumble and then correct as that’s what happens to most of us and to see how you handle it is really helpful. Your laughter is fantastic….better than the ugly words I might use. Looking forward to more. Thank you so much Eva. The Painter 12, A New Beginning class is open for registration and will start again Oct 22; would love to see you in the class. 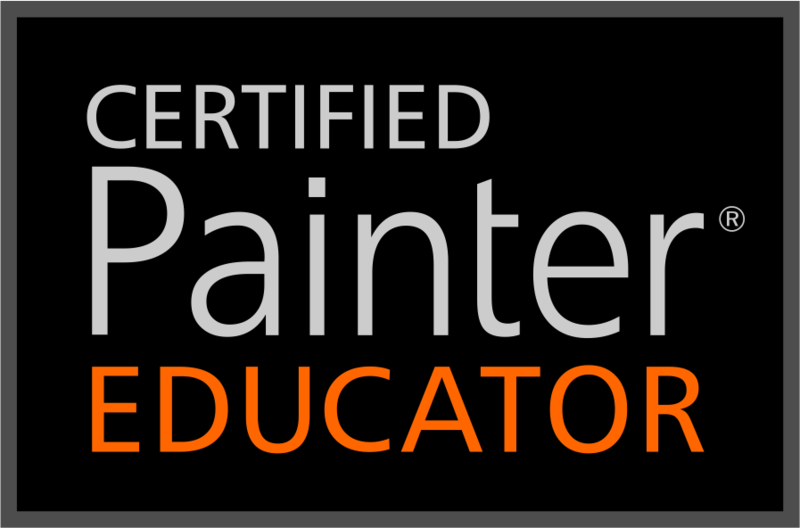 At DAA, Elaina Moore-Kelly will be teaching a beginner Painter 12 class for those who have never used Painter at all. Thanks for the kind comments on the videos. My friends tell me I ought to edit out the mistakes. But, I don’t think so because it isn’t realistic. I have crashes, I forget how to do things, just like everybody. Allowing the student to see what I do to rectify the situation I believe is helpful. Or, I just laugh about it and start again. I do want to have fun painting. Oh, you are so right, don’t edit out the mistakes! As a newbie, it is a course in it’s self to see how to recover and to know I didn’t crash something. So you are saying I better wait on the watercolor course? Guess I was hoping I could wade through it with the little knowledge I’m learning from my Painter 12 book. I’m so impatient!! So sorry, I misunderstood. If you would like to take the watercolor class, please do. Both classes will be ongoing for a while. Next session begins Oct 22. The session after that will be in Feb 2012. Holiday Open Studio will be in November and December and that is a fun class to take. I am excited about the watercolor class and have been trying to do something about it for the blog. Stay tuned…eventually I’ll get something up and the watercolor brushes, too. Skip, I just LOVE these two videos, you know how I love the wild and crazy painter stuff! Was studying cloning from the manual and remembered your cardinal painting I had seen earlier. Found this one first. Found out the answer to my questions, now to try to do it, using one computer spitting out the info and I am struggling on the other computer. When are you going to do this course again? I really chuckled when you mentioned channels and “groan” from the audience. Would like to learn all about them, basically understand and working on the selection PDF from fall paintings. Cheers to you and all the time you spend trying to teach us and for me, hammer it into my head. I’m hoping to have a cloning class ready soon. It will be open enrollment, so the time frame will not be shackled to the sessions.